Can You Substitute Mascarpone With Anything Else? 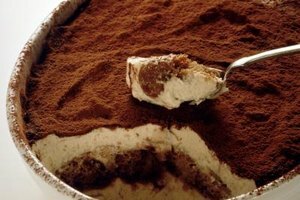 Use a substitute instead of mascarpone cheese in tiramisu. 1 How Much Fat Is in Feta Cheese? 4 How Many Calories are in Half-Cup of Shredded Cheese? Like English clotted cream, Italian mascarpone cheese is sometimes hard to find in the U.S. Its light, but creamy, flavor is difficult but not impossible to duplicate with other dairy products. Buy only the freshest ingredients and make only as much substitute as you can use immediately. Mascarpone is often referred to as cheese, although technically, it's a thick cream. Mascarpone contains at least 60 percent milk fat and may even contain as much as 75 to 80 percent. In Italy, it can be found fresh. In the United States, it's usually sold in tubs. Mascarpone is similar to cream cheese but has a slightly sweet, subtle flavor, and light, rather than dense, texture. It's often used as a filling in desserts such as tiramisu, or added to mashed potatoes or polenta. To replicate the creamy texture and slightly sweet, slightly tart taste of mascarpone cheese, you need high-fat ingredients, such as heavy cream, cream cheese and sour cream. If you're worried about calories, you can replace the cream cheese with Neufchatel cheese or the sour cream with Greek yogurt, but the taste and texture won't be exactly the same. When combined with other foods, though, you might not notice the difference. Try combining 2 parts cream cheese or Neufchatel cheese with 1 part heavy whipping cream or half and half. Stir in a tablespoon or two of sour cream or Greek yogurt to add a bit of tang. Blend the ingredients well in a mixer and taste. You can add more cream for a lighter texture or more sour cream for tartness. The ratio of sweet to tart might change, depending on what you're using the cheese for. A slightly tarter cheese stands up well to savory flavors, while a sweeter cheese is more suited to desserts. Regardless of whether you're using mascarpone cheese for a sweet dessert or a savory dish, the cheese is often costly and might not even be available in your area. Check in the specialty cheese section of your grocery store or where ricotta cheese is sold. If it's not there, the above substitute can end your search and save your budget. Using a substitute is especially practical if the recipe calls for more than a half cup or so of cheese because of the difference in cost. Eat By Date: What is a Substitute for Cheese?